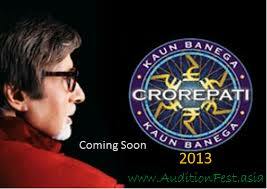 KBC season 7 registration was started from the 27 May 2013 to June 06 2013. As per the information KBC season 7 show will be broadcasted by the Sony Entertainment from end of the August or start of the Sep 2013. As we know that the KBC is hosted by the famous Bollywood super star Amitabh Bachchan and this season will be also hosted by this super star. In KBC season 7 Sony entertainment had extended the registration by 10 days for only Idea users. In the next 10 days 10 questions will come from the registration of the KBC season 7. These questions will be only for the participation of the Idea subscribers. Question - Which of these is another name of Saraswati, the goddess of knowledge? Question - Which of these cricketer is popular with title ' Sir ' in social networking sites ? Question - Which of these post in india is a constitutional Post ? Question - Which of these word used for a person under control of the another ? Question - In the context of Hindi film songs, If Munni is Badnaam and Chameli is Chikni then Babli is what ? K.K.DHUSIA FROM SHAHJAHANPUR U.P. my no. 9506066694,7500682621.
kbc7 registration may plz extended for the idea users four more questions should be asked for participention,in my blog writting i have pay hopeless . so there is an appeal on the request basis regtn may extended only IDEA USERS.so that maximum idea users can take part in the game and naturally IDEA MAKE THE WORLD FIST POSITION IN THE NETWORKING SERVICE.THAKS KBC THANKS AMITJE AND SONY TV THE GREAT.FROM ; SUDHAKAR SINGH [SAIL] RAJRAPPA PROJECT JHARKHAND. Show your talent man don't ask like this. Sir please mujhe aap apne sooo me ek chance dijiye meri three girls and one boy hai or me ek house wife huu. Sir please mujhe ek chance dijiye.